Every once in a while I feel compelled to write a post that is completely off topic on this blog. For the most part I like to keep my boring personal life over on Flickr or Vox. Usually this is because I feel pretty strongly about something - either happy, sad or controversial. This is one of those times. I am a lifelong horse fanatic and racing fan to boot. This was always considered very odd in my family, as not too many "nice Jewish girls" in Brooklyn are horse crazed. That said - it is in my bones somehow. I faithfully record and watch the races, usually sentimentally rooting for the underdog or local hero, the horse with the unusual story or quirky personality. As a matter of fact, I often use the nickname "Ruffian" as a username - which has led to a lot of confusion over time. The nickname has nothing to do with my personality but more to do with my love of the Thoroughbred Ruffian. [that's her in the photo]. 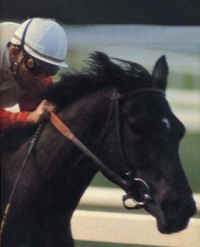 The winning-est filly of all time, with a bittersweet story and the honor of being the only horse buried at Belmont. Today the ghost of Ruffian was looking out over the track and definitely egged Rags To Riches on [see that sentimental streak again]. As if on cue (and to make this a perfect horse crazed media day for me), the first ever made for TV movie about Ruffian is being shown tonight on ABC. Reviews call it a winner. I hope it is. Got my TIVO all set! If the story of Barbaro pulled at your hearts strings - you better keep the kleenex nearby for this one. This blog will now return to it's regularly scheduled programming.